When it comes to showing your patriotic pride, there's no accessory too big — or too small. There were plenty of quirky clutches at Glamour's Women of the Year event, but Huma Abedin's Hillary Clinton clutch stole the show. For those of you who are into this look but aren't looking to spend a pretty penny before the primaries, there's a simple — and much more fun — way to DIY your own Clinton clutch. Glamour's event was all about supporting influential women who are making a difference in the world, so it only made sense that someone showed some Clinton pride with her ensemble. 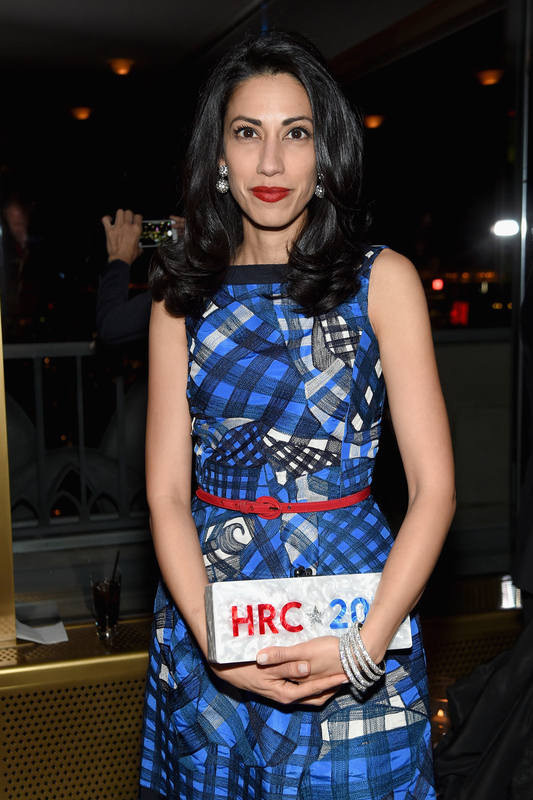 Abedin an adorable, glitchy "HRC 2016" clutch to the event with a patriotic outfit to match. According to Page Six, her clutch was a custom-made gift from designer Edie Parker and cost $1,995. So after tax, you're looking at over $2,000 for the VIP handbag. Abedin matched every part of her ensemble, right down to her lipstick. She paired a blue, white, and black dress with a skinny red belt to make the patriotic bag really pop. Adding some shiny layered bangle bracelets and a classic red lip, she created one stand-out look. There's a lot of candidate-themed merchandise out there already for the 2016 election, but this is by far the most high-fashion piece yet. If you've wishing you could get this for your Clinton-adoring friend this holiday season, you're in luck. Whether you're looking for a white elephant gift or trying to impress your most political pal, Abedin's clutch is the all-around perfect gift. Unfortunately the Clinton clutch is both expensive and custom made, but there's still a way to gift something similar without going over your $20 secret santa budget. It doesn't matter which bag type you choose, from clutch to cross-body, but white will make the logo completely pop. She has a few to choose from on her site. Whether you're looking for something colorful or subtle, Clinton's got you covered. You'll want your sticker to stay looking clean, so add a coat of Mod Podge to give it a polished look. The bling is optional, but it's a great way to get that crystal-studded look for less.